They’re running out of bike racks at the farmers market. We got up on Sunday to catch a 5:30am flight from Portland to San Francisco. The kids wore their pajamas for the whole trip. When we got home, we remembered that we’d left nothing in the fridge when we left but soy sauce, lemons, and ollalieberry jam. So even before napping, we headed to the farmers market (fortunately a Sunday market) and the grocery store to buy: everything. Staying in Portland made us want to live in Portland. Matt loved the idea that we might actually buy a house, and I loved the idea that we might actually have a yard where we could garden. And there were all those bikes. We even saw a double trail-a-bike, something I had heard existed but never spotted in the wild. And all those clearly marked bike paths, that made it possible for newbies like us to get where we were going, eventually. San Francisco greeted us with fog and temperatures in the mid-50sF (where they have remained). It was a culture shock to return to such a dense city, in both a good and a bad way. There are no unattached houses in our neighborhood and no front yards. It is impossible to grow tomatoes on this side of the fog line, and anything metal left outside grows rust and/or moss. But having such an easy walk to the farmers market and the grocery store was so nice. We always see friends there, and Sunday was no exception. Everyone admired our bike trailer/hand cart. In California, the produce is always local. And when we couldn’t bring ourselves to actually make dinner after making the week’s lunches, we walked across the street for sushi. 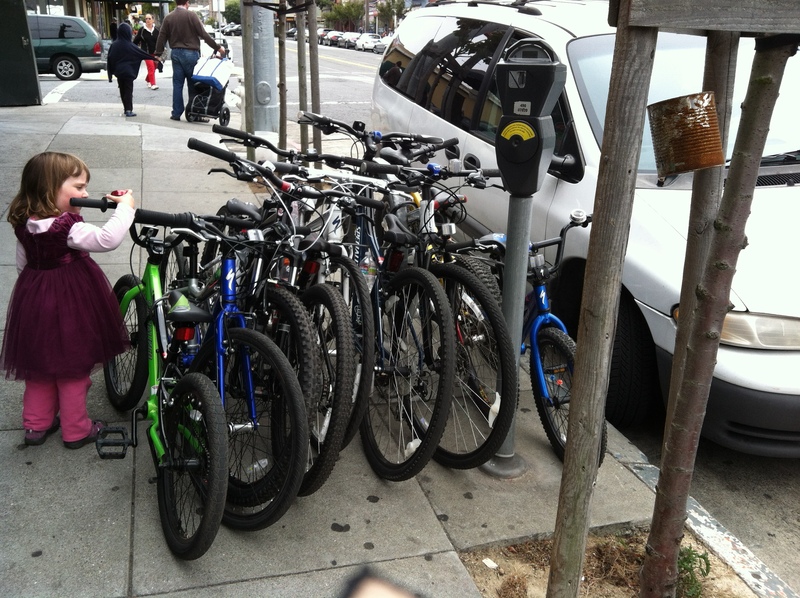 San Francisco has more bikes now too, it turns out. This morning was our son’s first day of second grade. I can’t believe how much he’s grown! I ruined my street cred by renting a City CarShare to carry all our gear on the first day of school (I couldn’t get both it and my daughter there on the Brompton). 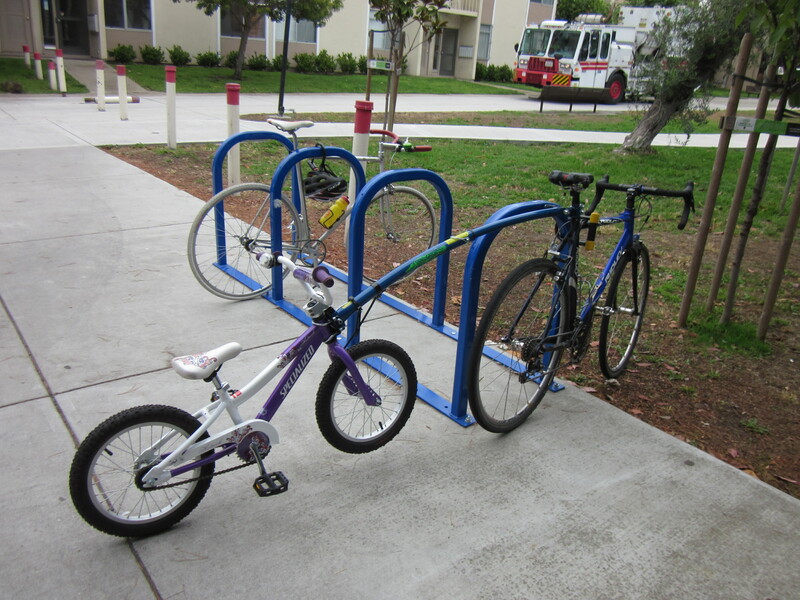 But Matt rode with our son to school on the MinUte, joined by at least five new biking families! Three Yuba Mundos (at least one assisted), one Trail-Gator, one trailer. One mom asked, “Are you Hum of the city?” Well, whoa. Yes I am. My name is Dorie, by the way, and I need to update that About page. Before we left on our trip, our kids begged to plant poppies. We found some pots and bought some seeds and prepared to console them when such sun-loving plants gave up before blooming. But when we returned, we found, to our enduring surprise, the first flower. We are glad to be home. RE: One mom asked, “Are you Hum of the city?” — Your charming blog’s fame is apparently spreading. jiggety-jig. Aw, that’s very sweet. Thank you.